A website’s purpose is to generate income by converting visitors into clients. To achieve it, you need to analyze and monitor your website continuously. Google Analytics is a free web analytics service that provides statistics on lead source, keywords, advertisements, and time that visitors spend on browsing your website etc. You can register by using your Gmail.com email address and password. After you have signed in, click on [Sign up] [1.1.]. After filling out the fields, click on the [Get tracking ID] button [1.2.]. You have to paste the tracking code, that was generated, into every web page that you want to track [1.3.]. After inserting the code, you can start using Google Analytics. By measuring conversions, you can examine which marketing channel is the most successful one. For example, you have spent 100,000$ on Google AdWords and Facebook advertisements. Google AdWords has generated 1000 visitors and 100 orders, and Facebook has generated 5000 visitors and 50 orders. Although you have spent the same amount of money on both means of advertisement, the conversion rate of Google AdWords is 10% and the conversion rate of Facebook is only 1%. Click on the [Admin] tab [2.1.]. Choose a website to which you want to add a goal [2.2.]. Click on the Goals option [2.3.]. To add a new goal, click on the + NEW GOAL button [2.4.]. MiniCRM can automatically receive campaign data stored in cookies by Google Analytics. Some part of this is collected automatically and data get in UTM parameter is also stored here. Sign up page: The page containing the form via which subscribers’ data was added to MiniCRM. Referrer page: The page from which the subscriber was redirected to the website containing the sign up page. If the subscriber used a search engine, “google.com” is displayed. If the integration is working, you can see source data in History on those clients’ card who registered via a web form [3.1.]. To see detailed statistics, go to the Reports > Marketing page. 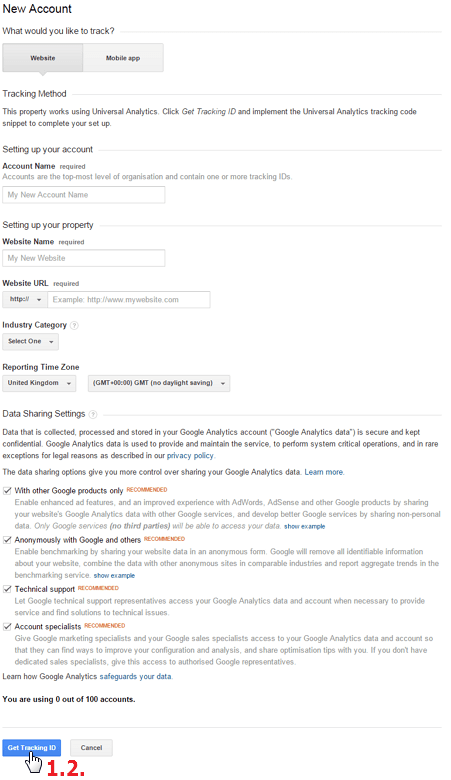 Google Analytics supports two tracking codes (analytics.js and ga.js) or (Universal Analytics and Classic Analytics). Integration is only working if you are using “ga.js” / Classic Analytics. “Universal Analytics” doesn’t store campaign data in the browser so MiniCRM is unable to receive them.